Don't forget! - Tomorrow and Sunday we are offering free range time to any fathers who use our range. This offer is valid from opening at 10am tomorrow 16th June until close at 7pm Sunday 17th June. Used Smith & Wesson M&P Shield 2.0 9mm. This pistol is like new and comes with its original box, 2 magazines and R/H IWB holster. Used Mossberg 500 12 Gauge. This used shotgun is in excellent condition and features wood furniture. It comes with a 28" barrel, modified choke and soft case. T - Rex Arms are celebrating this Father's Day Weekend by offering free range time to any fathers who use our range. We still have spaces available on this Sunday's CPL class. The class runs from 8am - 5pm - Sunday 27th May. The T-Rex A Girl and A Gun official re-launch is tonight at 6pm! We would love to have you join us for fellowship and shooting! Bring your friends and come on out from 6pm-8pm to find out what we are all about. New shooters and experienced shooters welcome! 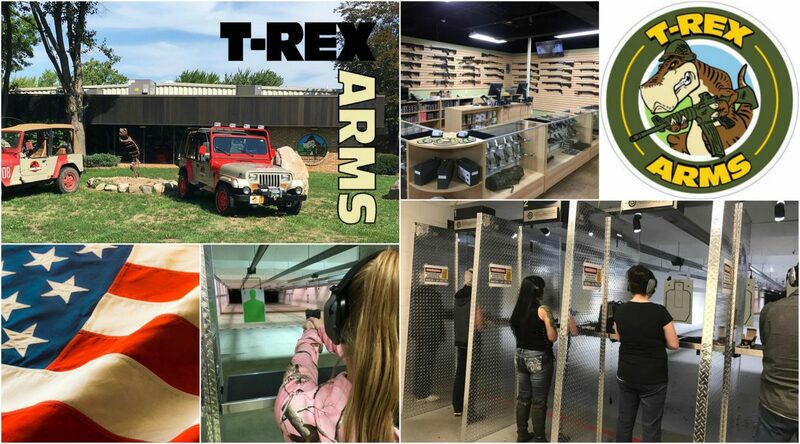 T-Rex Arms is offering free range time for any active or retired Military customers. This camouflage finished rifle is constructed using the highest quality materials, built on our patented self-regulating short-stroke gas piston system, machined from materials that belong to the super alloy family of steel alloys most often used in aerospace, LWRCI™ raises the bar on reliability and ease of maintenance- delivering the highest level of performance. The IC-Enhanced comes with a two-position gas block with normal and suppressed settings. Gas block is easily accessible enabling the user to pre-restrict the gas flow to the piston system, allowing the rifle to run smoothly and compensate for the added back pressure from running a suppressor. Gas-piston system can be accessed quickly by loosening two thumb screws. Our IC-Enhanced uses LWRCI™ manufactured- NiCorr treated cold Hammer Forged spiral fluted barrel that is 20% lighter than unfluted barrels of the same diameter and is designed to handle over 20,000 rounds. The increased surface area reduces heat – speeds up cooling. Nickel-boron coated bolt carrier delivers unparalleled wear resistance, corrosion resistance and permanent lubricity. This rifle is in good condition and comes with a Vortex Sparc Red Dot, Magpul M-Bus flip up sights and a Troy Retractable stock. Used Springfield 1911 TRP 45 ACP in Stainless. These pistols are tactically proven and intentionally designed to work under the worst conditions you’ll encounter. You’ll find all the quality, features and performance that you need in a 1911 of this class. TRP™ level quality starts with the forged national match frame and slide. These are precision fit and then mated with a match grade stainless steel barrel and bushing. The 20LPI checkering on the front strap, checkered mainspring housing and G10 grips will keep this gun in your hands when the sweat and adrenaline are flowing. The crisp 4.5 – 5lb trigger pull means you can more easily put shots on target when it matters most. 3-Dot tritium sights and an extended beveled magazine will remind you that the TRP™ was designed for use in high stress places – where the environment works against target acquisition, and mag swaps have to be lightning fast. The Stainless Steel finish will protect your TRP™ so it’s ready for the next mission. This pistol is in excellent condition and comes with its original hard case, leather single magazine holder, polymer double magazine holder, 2 magazines, 2nd set of Magpul grips, and polymer R/H holster.